Rhea Drysdale, CEO of Outspoken Media, Joe Youngblood, founder of Winner Winner Chicken Dinner, and Russ Jones, chief technology officer at Virante, are going to talk link building in this Pubcon Las Vegas 2014 session. But first a disclaimer from Bruce Clay, session moderator and Bruce Clay, Inc. president: if you are going to build links, proceed with caution. The tactics mentioned herein are for your information; Bruce Clay, Inc. does not endorse any of these tactics. 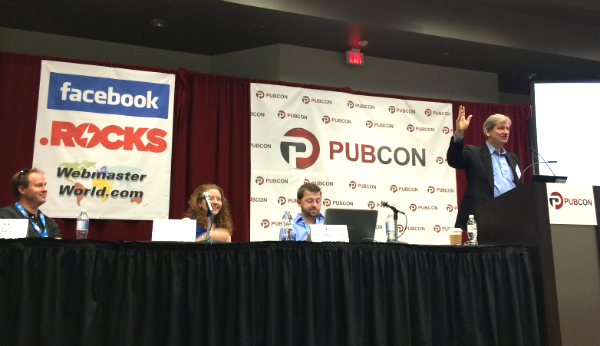 Tactics shared at a session on link building at Pubcon should be considered with caution. Editor’s note: Coverage included here is only a partial reporting of Drysdale’s presentation due to Jay Baer’s keynote address running long. Don’t just pay attention to Google Guidelines, Drysdale asserts. Pay attention to the actual law – make sure you understand the expectations for giveaways and contests. Take the Federal Trade Commission (FTC) as seriously (if not more seriously) than you do Google Guidelines. Build a real business. You need to have a firm grasp and understanding of your brand/business. What we do as marketers ends up becoming business strategy. SEOs go into a meeting and are asked to build backlinks. What SEOs need to know, though, is who are the client’s audience and what content resources we have to give them. Invest in diverse growth strategies. Marketing strategy has to be robust. Identify broad and related keywords to prospect for resource pages related to your topic. TOOL: Use nTopic to find words and phrases that occur on content like yours. You can outreach to the resource page to tell them about their broken link, or you can look up the backlinks to broken.com on Majstic, Moz and ahrefs and reach out to all of them about their broken link. Was this content written by experts? Would you consider this content trustworthy? Is this page an authority on the issue? Would you see this content in print? Are there any obvious errors on the page? You’ll have more success if you create a replacement piece of content that is superior to the first. Use Archive.org to determine relevancy, quality and potential for improvement. Finding good webmaster contact information is one of the most difficult parts in this process. Consider outsourcing it. Try Mechanical Turk or the outreach app in brokenlinkbuilding.com. Finding the right outreach style can dramatically improve your conversion rate! Long form: take the time to personalize a long email that will explain why your new piece of content is better than the first. This is the most successful strategy, but also the most time-consuming. Double tap: webmasters don’t need a nudge – they need a complaint. Create a false demand by sending complaint emails from email addresses (that aren’t yours). Youngblood offers four different link building strategies (see slides). Set up the scholarship via scholarship management service. Create a page on your website describing the scholarship. Find targets on .edu sites to link to your scholarship page. Get listed in scholarship search engines and directories. Use scholarship-related content to drive links. Google has slapped down guest blogging. Interview link earning is a very similar concept, but it’s much better. Join the FindExpertsToInterview.com email list and MyBlogU. Write up some ideas for questions you’ll want to talk about and let the person you’re interviewing know your rough idea of how the interview will go so they know what to expect. Once the interview is done publish it and ask them to share socially. Use that interview for outward-facing communication to show that you are a go-to source for this information. This is a passive strategy. Find images that people are looking for. Use Ubersuggest.com. Find a highly trafficked image request that you can create. Use UberSuggest.org set to “images,” and type in a base query. Sort by search volume and fin image keywords that match content you’re creating such as blog posts, articles, product pages, etc. Find image queries that currently don’t have a lot of good results. Make the images and publish them on your site with ALT and Title tags. Do reverse image searches at least once a month to find new websites that have used your image and ask for a photo credit with a link to the original article. Reddit was accepted into Google News, and journalists are paying increasing attention to Reddit. Look at the types of content shared on any of the default sub-Reddits such as DataIsBeautiful. Create content that matches that sub-Reddit and target Reddit users to share the content on your behalf (some allow you to self-submit also). Once your content is shared, join in the conversation about the content. Encourage upvotes on your content by sharing it in social media (but don’t ask for upvotes – the Reddit community heavily frowns on this). Consider using Reddit ads to target a sub-Reddit with thank you’s, special discounts, etc. for sharing and liking your content. EDITOR’S NOTE: We recommend checking out our online SEO Tutorial for step-by-step guidance on proper link building, link profile maintenance, and many more search engine optimization topics. I don’t like broken link building – it can be regarded as manipulative. Google will find a way to punish it eventually! I have tried broken link building technique and it is very time consuming process. I think it is more simple to build new backlinks than to hunt for broken links and acquire that links.